By 2007, Justin Timberlake had released his first two solo albums, 2002’s Justified and 2006’s FutureSex/LoveSounds, and seemed to be kicking around the music and film worlds doing whatever he wanted. Songs like “SexyBack” and “My Love” came and went in 2006, and with a 2007 tour on the horizon, Timberlake didn’t have much from FutureSex to release as a single, save tracks like “LoveStoned/I Think She Knows.” Fortunately, in January of that year, producer and occasional recording artist Timbaland released “Give It To Me,” an absolute club banger featuring guest appearances from both Timberlake and a bumpin’ and grindin’ Nelly Furtado. Even today, “Give It To Me” is a verified club jam, reminding the world once again that Timbaland makes really, really good beats. While Shock Value, the record that birthed the track, isn’t actually very good, this song is—and for a hit maker like Timbaland, singles are all that matter. While Furtado’s affected lilt certainly makes “Give It To Me” danceable, it’s the verses from Timbaland and Timberlake that give the track its bravado. In his gritty singing voice, Timbaland calls out rivals like producer Scott Storch, saying that he’s “a real producer and you’re just a piano man.” Timberlake—clad in his signature 2007-era fedora in the video—is equally self-hyping, big-upping both “SexyBack” and his success in general, saying “We missed you from the charts last week / Damn. 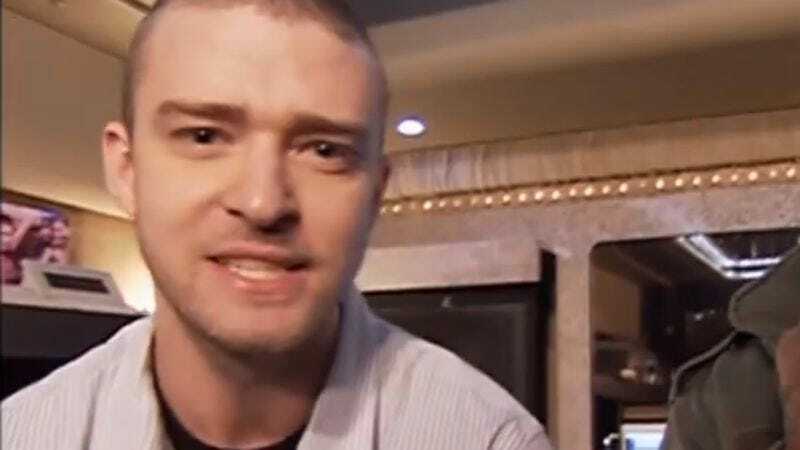 That’s right, you wasn’t there.” It’s a silly little brag, but it’s also a sharp reminder that Justin Timberlake makes singles that sell millions and millions of copies, and his competitors shouldn’t forget it. Equally savvy is the combination of guests on the track. Timbaland’s presence meant the track could be serviced to urban radio, while Furtado and Timberlake locked down two other markets: pop and lite-rock. Beyond all that, the song was an electro-infused dance track, meaning that it would get played—constantly, judging from what I heard—in clubs all over the world. That combination of markets sent the track quickly to the top of the Billboard Hot 100 and, to date, it’s Timbaland’s only solo no. 1 single. It was Timberlake’s fourth in the States alone, and that’s not including anything he recorded with ’N Sync.